Wavefront histograms let you compute, store, and use distributions of metrics rather than single metrics. Histograms are useful for high-velocity metrics about your applications and infrastructure – particularly those gathered across many distributed sources. Note The histogram feature requires a separate license and is not enabled on your cluster by default. Alert notifications can now include an image of the chart that triggered the alert. In many cases, the image is included by default. For simple alert targets – email and PagerDuty targets that you add directly in the Create Alert dialog, a chart image is automatically included. For PagerDuty alert targets you create from the Create Alert Target page, notifications include the image. The predefined templates for custom HTML email targets and for Slack targets include images by default. If you created custom alert targets before version 2018-26.x was released, you have to modify the template to include the image. See Adding Chart Images to Older Custom Alert Targets for sample setup instructions for an email alert target. Note We do not include the alert image in the notification if the alert query takes more than one minute to execute. 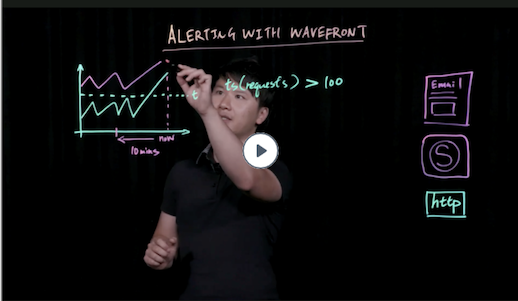 Starting mid-August 2018, Wavefront supports running queries with lower priority. Lower-priority queries don’t interfere with higher-priority queries, such as alerts, or with interactive user queries. For example, use the new permission if you’ve set up a reporter account that performs Wavefront reporting queries. By giving the reporter account the Batch Query Priority permission, you can ensure that lower priority queries don’t interfere with higher priority queries such as alerts or interactive user queries. The Name field for an AWS integration is now available as a point tag named accountAlias. As a result, you no longer have to specify the account ID for use in queries but can use the name instead. The at() function now works correctly with arguments that depend on window size, such as the vw parameter or windowWidth() function.